Today I’d like to talk about beauty resolutions. I know there’s been a lot of talk about goals on my blog recently, whether it’s my goals for the year or my February goals, but I wanted to chat about some less serious resolutions that are primarily to do with beauty. Over the past year or so, I’ve felt a bit distant from the whole beauty thing – you can read more about this here. When I first discovered blogs and YouTube I was a complete beauty obsessive; buying all the latest releases from my favourite brands and accumulating quite a substantial collection of makeup. But then I kind of fell away from it a bit, preferring clothes or homeware to lipstick. However, I feel like I’m now starting to get that beauty itch back. It’s been so long since I bought new products that I’m getting to the point where I need some new things and it’s making me excited for the first time in a long while. However, with this rediscovered love for beauty, I want to create some new rules for myself. In other words, I want to make sure that I’m making the most out of my beauty collection and actually using the stuff that I buy. So I’ve come up with a few beauty resolutions for this year and beyond. 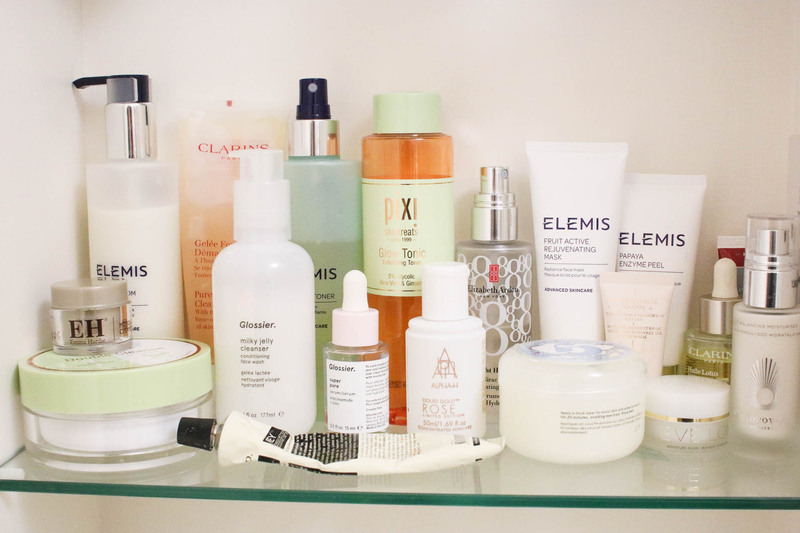 I’m going to admit something – I am pretty lazy when it comes to skincare. Well, at least I used to be. 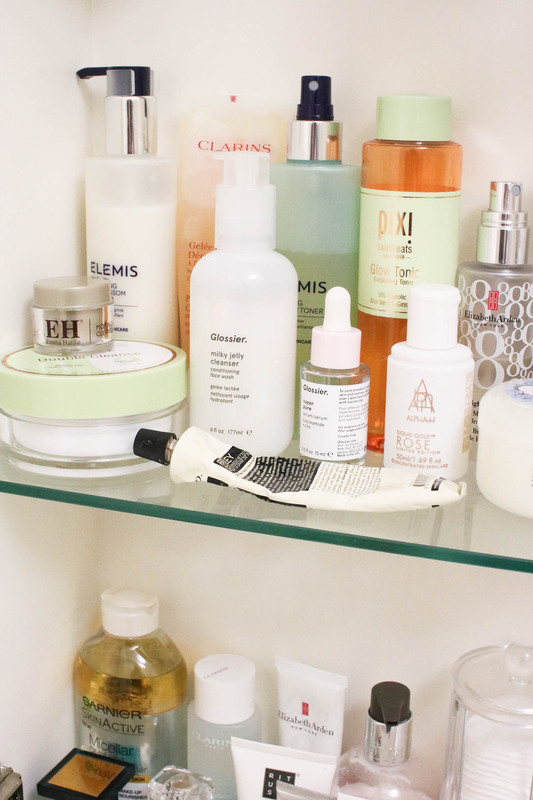 No matter what products I had, or how good my intentions were, I’d just never be able to keep to a skincare routine. I’d take my makeup off at night and fall asleep, being too lazy to get out of bed and cleanse my face in the bathroom. However, I’d really like that to change. Recently I have been a lot better with doing my skincare in the mornings and evenings, so I’d like to keep this up. One thing I’ve found that has helped is keeping everything really simple – not having too many products on the go at the one time and not trying to use everything at once. At the moment I’m trying to get through some older products that aren’t quite finished yet and then I’d like to reassess my skincare stash. I’ve managed to reduce it quite a bit already (the above pictures show almost my entire collection – apart from day cream and eye cream!) but I still have a bit too much. 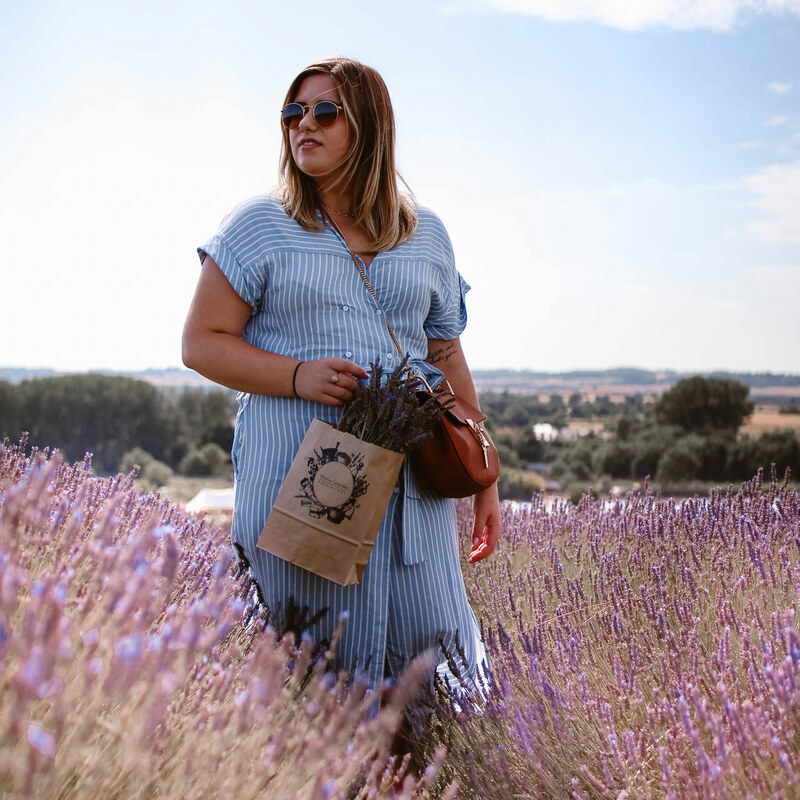 I have become a bit complacent with my haircare routine in recent years – I normally buy whatever shampoo is on offer in boots, I don’t use treatments and to be honest I rarely do anything with it other than brush it. However, I’ve started to have some issues with my hair that means I’ll have to start taking better care of it. I recently went back to being brunette, which has already helped the health of my hair so much. No more purple shampoos, dry hair treatments or constant root upkeep is needed. I’d like to keep this up, so I’m making sure I go for regular trims at the hairdressers and minimising the amount of blonde I get put in my hair for a while. However, my main resolution when it comes to hair is to invest a bit more in the products I use. Of course, there are some budget products that I love, however I have a problem scalp and it’s getting to the point where I have to pay a bit more for my haircare to help it. I’ve already invested in a clarifying shampoo and a shampoo for an irritated scalp (I have both severe scalp psoriasis and incredibly oily natural hair – oh the joys!) but I’d like to introduce a few treatments into my routine as well. A good scalp treatment and also some sort of strengthening treatment for the ends of my hair. Any recommendations welcome! Laziness is definitely a theme in this post – because like the previous two points, I have become a bit lazy when it comes to putting on makeup. I always put on makeup for work, but I normally use the exact same products everyday to save time which means the majority of my makeup collection lies untouched. So I’d like to make more of a conscious effort to use more makeup – because to be honest I think it’ll make me feel a bit more confident and also I do miss the experimentation of playing around with makeup. I am definitely bored of the concealer – brown eyeliner – mascara routine I’ve got going on at the moment. To facilitate this, I’d like to have a bit of a clear out of my collection. I have so much stuff that is definitely out of date now and I also just have too much that I’ll never use again. After that, I’d like to buy a few key items that I used to love but have forgotten about. Chanel Vitalumiere Aqua, Armani Luminous Silk and Shu Uemura eyelash curlers are currently on my list! So those are some of my beauty resolutions that I’d like to stick to. I do really want to stick to these as much as I can, although I know there will be evenings when I can’t be bothered doing my skincare and some mornings when I’ll go for my quick 5min makeup. But nobody’s perfect, eh? 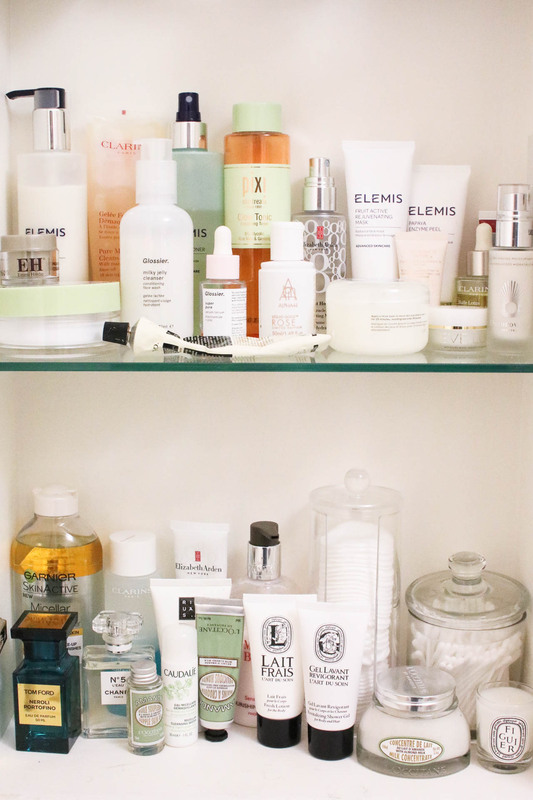 I’d love to hear if you have any beauty habits you’d like to keep to, or get rid of! I’ll keep you updated on how mine go and hopefully will have an updated skincare routine at some point (if I stick to one for long enough…)! Are you following me on Instagram? I post everyday – click here for daily lifestyle/interiors/outfit posts. "Tips for arranging & keeping fresh flowers"